Nicola Cimaglio first appears in the Painesville, Ohio, area in the 1920’s. 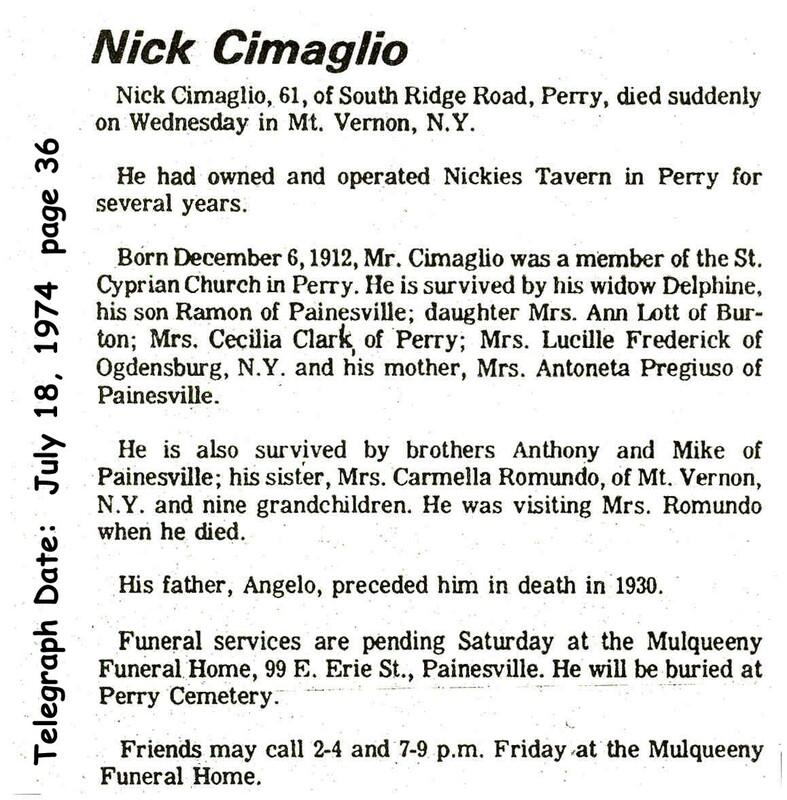 In America, Nicola Cimaglio was known as Nick Cimalgio. Nicola Cimaglio, son of Angelo Cimaglio and Maria Antonia Pasquarelli, was born on December 5, 1912, at Casalciprano, Italy. He married Delphine P. Borrelli, daughter of Crescenzo Borrelli and Lucia Lombardi. Nicola died on July 17, 1974, at his sister Carmella’s home, while visiting Mt. Vernon, Westchester County, New York, at age 61. His body was interred at Perry Cemetery at Perry Township, Lake County, Ohio. Nicola Cimaglio immigrated to the United States on February 18, 1921, at age 8. He immigrated at the Port of Philadelphia. He immigrated with his mother, and brother, Michele Cimaglio. They were joining Nicola’s father in Willoughby, Ohio. (Though information indicates they may have immigrated to Providence, Rhode Island.) Nicola Cimaglio became a citizen of the United States on March 8, 1937. Nicola resided at 477 Owego Street, Painesville, Lake County, Ohio, when he was naturalized. 3. Cecilia Cimaglio. Cecilia died in 1997.